If you still love coffee, but do not desire the effects of caffeine, we have an exquisite line of decaffeinated coffee to choose from. In addition, if you love the taste of coffee with brandy, liquer, or Irish Whiskey for a warm and glowing cup of brew around the campfire or fireplace, these choices are perfect for the occasion. Choose from our Sumatra Decaf Swiss Water Process, Flavored Decaf, FTO Decaf from Peru, or delicious Water Processed Colombian Decaf. The Sumatra Swiss Water Process decaf coffee has a nice full body, with little acidity. Our Flavored Decaf is 100% Arabic Coffee great for early mornings and those whom burn the midnight oil. Our FTO Peru Decaf is Medium Roast and certified Organic. 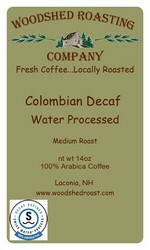 This is a Swiss Water Processed Decaf which maintains the flavor and characteristics of the bean. And Finally, our Colombian Decaf is a medium roast. This Swiss Water Processed Decaf contains all the full flavor and taste of its original Colombian flavor profile. From this lineup, one can easily find the perfect coffee without the effects of being over stimulated. Perfect anytime, from peaceful dawn mornings to romantic or inspirational late-nights, this is the perfect gift for your self, family or friends. Browse and shop from our line of decaffeinated coffee at Woodshed Roasting Company, knowing you will be purchasing the best in coffee. If you have any questions or comments, please contact us and one of our excellent customer service staff will assist you with your purchase.